The “Send Multimedia Message” option functions similar to the “Send MMS Message” option. It allows you to define a subject, message text, and optionally include multiple content files (uploaded via the browser). Content files may include text files, audio files, image files, Java applets, and/or other content types that might be supported by the receiving device. NowSMS automatically formats the content so that it is accessible via a dynamically generated URL on the MMSC, and sends either a WAP Push message, or a standard text SMS message, which includes a URL link to allow the content to be retrieved by the receiving device. Use the “Message Type” setting to specify whether the link should be sent via a “Text SMS” message or a “WAP Push” message. 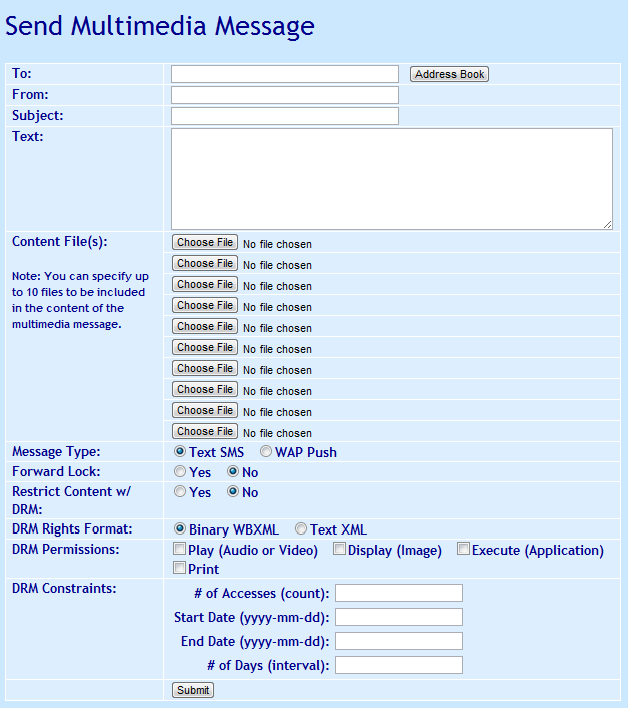 When sending a Multimedia Message via this interface, it is possible to specify Digital Rights Management (DRM) restrictions over the content of the message, if DRM restrictions are supported by the receiving device. The most basic level of DRM is forward locking. When “Forward Lock” is set to “Yes”, this indicates that the receiving device should not allow any non-text objects in the message to be forwarded off of the device. The device may allow the user to extract pictures, videos or sounds from the message and save them on the phone. However, any such objects remain forward locked, such that they cannot be forwarded to another user or transferred to another device. More advanced DRM restrictions can be applied to limit the number of times that the user can access an object, or start and end dates can be specified to limit how long the user can access an object. These advanced DRM restrictions can be applied by setting “Restrict Content w/ DRM” to “Yes”. When this setting is enabled, forward lock is also implied, and the value of the “Forward Lock” setting is ignored. “DRM Rights Format” specifies whether the DRM rights object should be encoded using a Text XML format, or a Binary WBXML format. While Binary WBXML format is always preferred for separate delivery objects, many Nokia phones only support Text XML format for the combined delivery process supported by this interface. “DRM Permissions” specify what types of access are allowed against the object. For example, an audio or video object requires “Play” permission before the user can access it. An image requires “Display” permission before the user can access it, and it requires “Print” permission if the user is to be allowed to print the image to a printer , perhaps over Bluetooth. An application requires “Execute” permission before the user can make use of the application. In all cases, the forward locking is assumed, so that the user is not allowed to forward or transfer the object from the device. If you are sending multiple types of objects in the MMS message, check all permissions that are required for the different types of objects that you are sending. “DRM Constraints” specify constraints with regard to how long the object should remain accessible to the user. It is possible to specify one or more of these constraints. “# of Accesses (count)” specifies the the user can only access the object this number of times before access is no longer allowed. “# of Days (interval)” specifies that the user will be allowed to access the object for this number of days after initial receipt of the object. The user can either enter a number of days here, or they can enter any valid value defined for the “<interval>” element in the OMA DRM Rights Expression Language specification. For example, P2Y10M15DT10H30M20S represents a duration of 2 years, 10 months, 15 days, 10 hours, 30 minutes and 20 seconds. For additional information on DRM Restrictions, please see Digital Rights Management.